Hewes Pictures (the only short film distributor in the United States) will be premiering A.I. TALES this July. A.I. 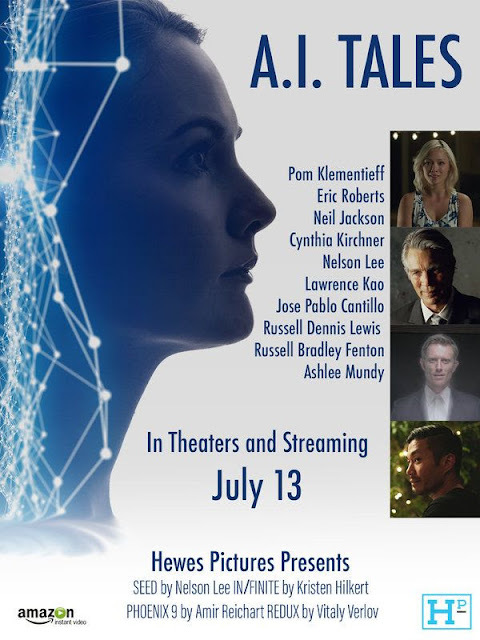 TALES, a collection of short sci-fi stories from short film distributor Hewes Pictures is being released theatrically by Freedom Cinema, a jumpstart anthology film label. The collection of stories feature world-renowned talent such as Pom Klementieff ("Guardians of the Galaxy", "Avengers"), Eric Roberts ("The Dark Knight"), Neil Jackson ("Westworld") among many others. The film is made up of futuristic, high concept stories about artificial intelligence. Whether it's love found in time of over-population or exploration of the unknown and space-travel, A.I. TALES has a bit of something for every fan of the genre. Altogether, these stories provide a one-of-a-kind experience and a unique view of the near future. Below we have the trailers for each short film contained in this anthology film. SEED TRAILER from Nelson Lee on Vimeo. IN/FINITE - Teaser Trailer from Kristen Hilkert on Vimeo. Phoenix 9 (teaser) from Hewes Pictures on Vimeo. Redux (teaser) from Hewes Pictures on Vimeo. A.I. TALES will premiere at Black Box Theater in Los Angeles, 13th July - 19th July, and on Amazon.